So is it coming or going? Looking at the Zündapp Janus directly from the side makes it difficult to tell. 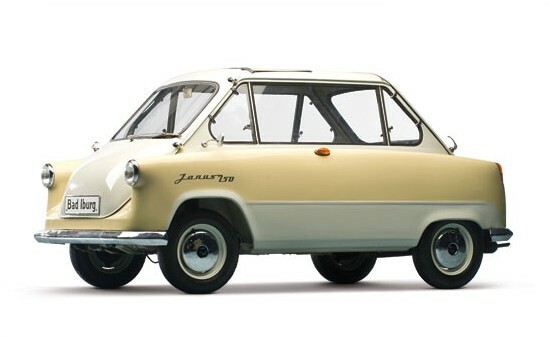 The Janus was the only car Zündapp ever built, although they made plenty of motorcycles. In production for 1957 and 1958 only, 6,902 were made – a testament to the size and production capacity of Zündapp at the time. It’s one of the the muscle cars of the group featured today, making 14 horsepower from it’s 248cc single-cylinder. Top speed is 49 mph. Fun fact: the villain in the Pixar film Cars 2 is a Zündapp Janus. Only a few are left. Read more here. This entry was posted in Uncategorized and tagged 1958, auctions, cars, classic cars, janus, microcars, rm auctions, zundapp by classiccarweekly. Bookmark the permalink.